The 27-kilometre Large Hadron Collider at CERN could soon be overtaken as the world’s largest particle smasher by a proposed Chinese machine. For decades, Europe and the United States have led the way when it comes to high-energy particle colliders. But a proposal by China that is quietly gathering momentum has raised the possibility that the country could soon position itself at the forefront of particle physics. Scientists at the Institute of High Energy Physics (IHEP) in Beijing, working with international collaborators, are planning to build a ‘Higgs factory’ by 2028 — a 52-kilometre underground ring that would smash together electrons and positrons. 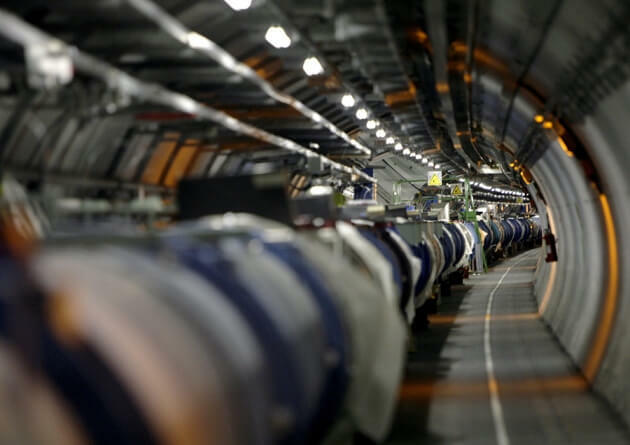 Collisions of these fundamental particles would allow the Higgs boson to be studied with greater precision than at the much smaller Large Hadron Collider (LHC) at CERN, Europe’s particle-physics laboratory near Geneva, Switzerland. Physicists say that the proposed US$3-billion machine is within technological grasp and is considered conservative in scope and cost. But China hopes that it would also be a stepping stone to a next-generation collider — a super proton–proton collider — in the same tunnel. European and US teams have both shown interest in building their own super collider, but the huge amount of research needed before such a machine could be built means that the earliest date either can aim for is 2035. China would like to build its electron–positron collider in the meantime, unaided by international funding if needs be, and follow it up as fast as technologically possible with the super proton collider. Because only one super collider is likely to be built, China’s momentum puts it firmly in the driving seat. Speaking this month at the International Conference on High Energy Physics in Valencia, Spain, IHEP director Yifang Wang said that, to secure government support, China wanted to work towards a more immediate goal than a super collider by 2035. “You can’t just talk about a project which is 20 years from now,” he said. Electron–positron colliders and hadron colliders such as the LHC complement each other. Hadron colliders are sledgehammers, smashing together protons (a kind of hadron that comprises three fundamental particles called quarks) at high energies to see what emerges. Lower-energy electron–positron machines produce cleaner collisions that are easier to analyse, because they are already smashing together fundamental particles. By examining in detail the interactions of the Higgs boson with other particles, the proposed Chinese collider should, for example, be able to detect whether the Higgs is a simple particle or something more exotic. This would help physicists to work out whether the particle fits with predictions made by the standard model of particle physics, or whether, for example, multiple types of Higgs boson exist. The machine would be a big leap for China. The country’s biggest current collider is just 240 metres in circumference. Ten years ago, Chinese particle physicists would have doubted their ability to host a 52-kilometre machine, says Ian Shipsey an experimental physicist at the University of Oxford, UK. But after several successes in collider and neutrino experiments, including showing in 2012 how neutrinos change from one form to another, China now has “the confidence, for the first time, to propose an ambitious new machine”, says Shipsey. The Chinese government is yet to agree on any funding, but growing economic confidence in the country has led its scientists to believe that the political climate is ripe, says Nick Walker, an accelerator physicist at DESY, Germany’s high-energy physics laboratory in Hamburg. Although some technical issues remain, such as keeping down the power demands of an energy-hungry ring, none are major, he adds. Wang says that China would welcome international funding contributions for both projects, and that if there is a lot of support the ring size could be expanded to 80 kilometres, increasing the scientific scope . But he adds that the country will not wait for collaborators before pressing ahead. The next two years will be spent sketching out a design and establishing what technical difficulties need to be ironed out. Detailed design, budget and location plans will follow, and construction could begin in as little as five years, adds Wang. But because, realistically, only one super collider will ever be built, says Shipsey, “the world will have to work together to locate it in the best place” for it to happen as quickly as possible. He believes that, in the next five years, the Chinese plans will produce positive competition between China, the United States and Europe, maximizing the chances of a single contender emerging. There is a final complication. Plans are well under way for an International Linear Collider (ILC), an electron–positron linear accelerator that could operate at much higher energies than China’s proposed 52-kilometre electron–positron ring. Physicists are strongly behind the project, but it is yet to secure funding or a host country, says Brian Foster, who leads the European ILC design team. He fears that the Chinese plans could dampen support for the project. Japan has shown a strong interest in hosting the ILC, but has not “got a stranglehold” on the project, says Foster. He suggests that China could step in, and argues that because the ILC has a wider energy range than a ring collider, the linear accelerator could do more than study the Higgs: it could explore other poorly understood particles, such as the top quark, and any other phenomena that the LHC might discover.